Ayaan Hirsi Ali discusses Nomad: From Islam to America: A Personal Journey Through the Clash of Civilizations. Ayaan Hirsi Ali discusses Infidel. Ayaan Hirsi Ali , Infidel. Time Magazine, 2005: "one of the 100 most influential people in the world"
Ayaan Hirsi Ali is currently considered a "single author." If one or more works are by a distinct, homonymous authors, go ahead and split the author. 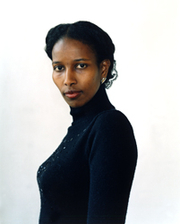 Ayaan Hirsi Ali is composed of 17 names. You can examine and separate out names.